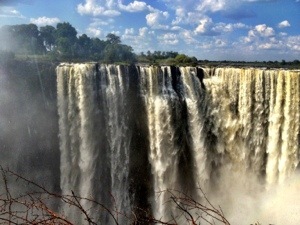 We made it to the town of Vic Falls by late morning and pulled right into the adventure booking office. For many people in our group, including our woo girls, this was the last day of the trip. So we all sat together and got a quick overview of each activity available. There was an endless number of wallet emptying things to do: elephant riding, lion walks, helicopter trips, bungee jumping, zip lining, flying foxes, the gorge swing, and white water rafting, among many other things. We signed up for the combo package of white water rafting and the gorge swing, both of which were giving me heart palpitations even as I handed over my credit card to pay. Luckily, we booked for the following day, which gave me a full 24 hours to mull over my impending doom. For that afternoon’s activities, Kelsi, the boys and I decided to take it easy and head over to the falls to take some photos. It was only a quick five minute drive to the entrance to the park, and from there we got to explore the lookout areas on our own. 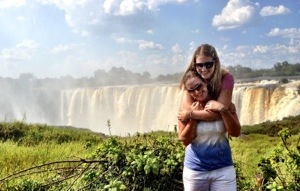 Our first glimpse of the falls was spectacular! 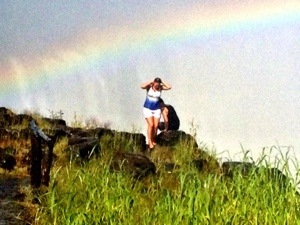 It was a cloudless afternoon, with a rainbow in the background and tonnes of white water crashing into the gorge below. 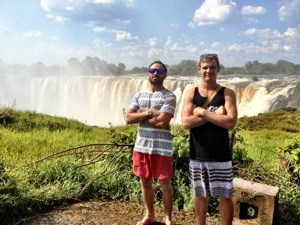 We were now standing in the Zimbabwean side of the falls, looking towards the Zambian part we had swam in just two days earlier. The pools we swam in looked even more dangerous from this side, and we could even see a small group of people on Livingstone Island about to start their tour. There were 12 lookout points from the Zimbabwean side of the park. 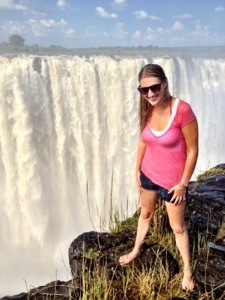 Each one had an even better view and a different section of the falls to look at. At one lookout point you could stand right on the edge of the cliff looking out towards the falls. You hardly even realize that the rocks just abruptly end and fall straight down to the bottom of the gorge. There were no ropes, and no park staff members to watch people; anyone was free to just walk right up to the edge and look over. Makes me wonder how many people have just fallen over the edge, never to be seen again. The last part of the falls started to get pretty misty. We all had to cover our cameras so the water wouldn’t get in, and we were all drenched by the time we hit the final lookout. Two of our three cameras stopped working, and even though we would have loved to hang out on the rocks, looking over the falls forever, it was time to salvage the last of our electronics and head to the bar for milkshakes. The outing was definitely worth the $30 US dollars that it cost. 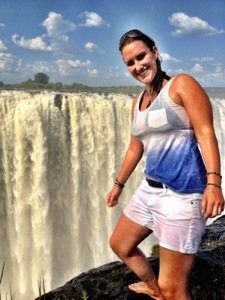 Unlike my experience at Iguazu Falls, Victoria Falls was almost completely void of tourists. 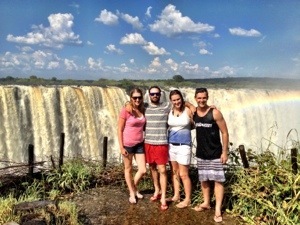 Apart from four other Germans we ran into, the four of us were the only people at the falls that afternoon. It was amazing! When we’d had our fill of the falls, we made our way back to the campsite to shower and relax. For dinner that night, we had reservations for 13 at a fancy restaurant down the road called “The Palms”. 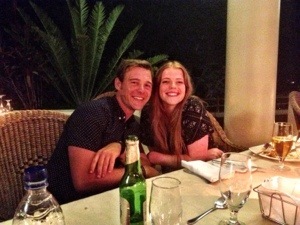 Originally a romantic dinner for two for Robbo and Emily, the other 11 of us decided to crash and have a big meal all together. 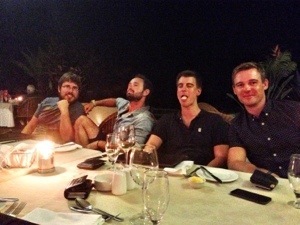 We all dressed up (for the first time this trip) and sat down to a wonderful meal. The restaurant served traditional African dishes with unique types of meat. We tried ostrich, crocodile and warthog as our strange new animals, and then a few classic dishes that were out if this world. 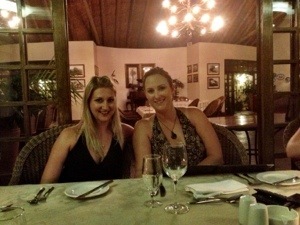 Kelsi and I started with a mouthwatering prawn, coconut and ginger soup and a chicken ratatouille type dish. 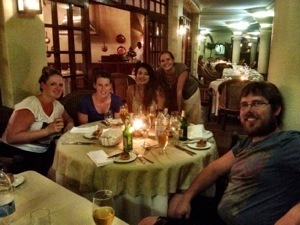 For our main we tried the warthog and the most incredible beef medallions I’ve ever eaten. Between 13 of us we tried pretty much everything on the menu; everyone got to taste a little bit of each and by the end if the meal I could hardly move I’d eaten so much. When dinner was over, a few of us moved along to the casino across the street. The place was empty, even in a Friday night, but we had a great time playing slots, black jack, and dancing at the little nightclub. Afterwards, we went back to the campsite for drinks at our chalet and a middle of the night swim in the pool. 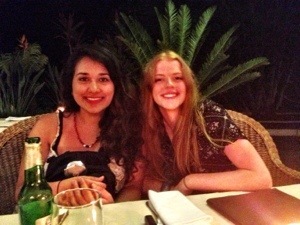 A pretty great way to spend our last night with Mel, Cara and Sarah. Miss you ladies already! 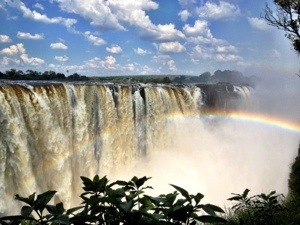 This entry was posted in Africa, Zimbabwe and tagged Travel, Victoria Falls, waterfalls, Zimbabwe by hilarylust. Bookmark the permalink. Haha! Not anything big. Sandy was doing really well at the Black Jack table, but he kept throwing money down for everyone to play and in the end came out even. So overall not too bad!